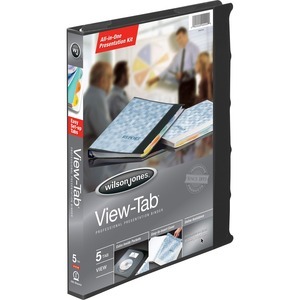 Presentation binder includes innovative, View-Tab transparent dividers and a unique, durable design. Clear overlay on front, spine and back allows easy customization. Print all your titles on one sheet and place it in the clear title page sleeve in the back of the binder. View-Tab dividers allow you to see your titles through your tabs, even when binder is closed. Poly material won't lift ink or toner from pages. Use free templates directly from the web to print the cover page, table of contents and tab sheet. Metal round rings are back-mounted to let pages lie flat. Binder also features exposed rivets and a sturdy chipboard core.